Many Americans take their cars to junk yards, swapping their old and unusable vehicles for cash. If you’re considering this option, you’re probably curious about what actually happens to a car once its left at a junk yard. Luckily, here are some answers that should clear up any concerns or questions you may have about this process, which is especially popular with all the cheap junk yards in Florida. The first thing you should know about Florida junk yards nearby is that they make it a fairly simple and straightforward process. When you’re ready to say goodbye to that old clunker that has been sitting idle in your garage or yard for quite some time, bring it to a reputable salvage yard. There, staff will accept end-of-life vehicles, which are cars that have reached the end of their useful lives through natural wear and tear or floods, accidents, and fires. Once you leave your car behind, salvage yard staff will take your car’s VIN (vehicle identification number) out of the DMV system, which means no one will be able to buy your car, fix it, and sell it without the buyer knowing it was a junk yard vehicle. Next, these vehicles are decontaminated and depolluted before being examined for useful parts. Customers can come in and select components and car parts they’d like to take. This often includes lead batteries, aluminum wheels, copper wiring, plastics, steel, rubber, and precious metals like platinum or palladium. 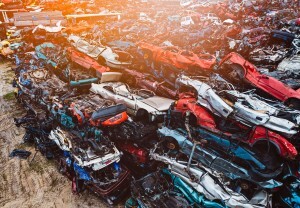 Whatever is left over of your vehicle will be further processed, crushed, and eventually recycled. This is great for the environment, as recycling vehicles ensures 11 million tons of steel are kept out of landfills and put back into consumer use. 800,000 non-ferrous metals will also be spared from the landfill. This steel is sold to manufacturers and processors who use it to create new goods for consumers. In fact, nearly 25% of today’s steel is made from recycled metal. Almost 7,000 vehicles were recycled last year, with many coming from junk yards in Florida. It’s better for the environment and is a good way to make a difference, that’s for sure!